Nigerian born Amina Mohammed is the United Nations secretary-general’s former special adviser on post-2015 development planning. She was heavily involved in planning the Sustainable Development Goals (SDGs), a new development agenda to be implemented over the next 15 years, and in getting UN member states, the private sector and civil society to agree on them. The SDGs were formally adopted by 193 countries on 25 September. In this exclusive interview with Africa Renewal’s Kingsley Ighobor, Ms. Mohammed talks about the evolution of the process, the commitments made, the challenges ahead, and why the goals, if implemented, could transform the world. 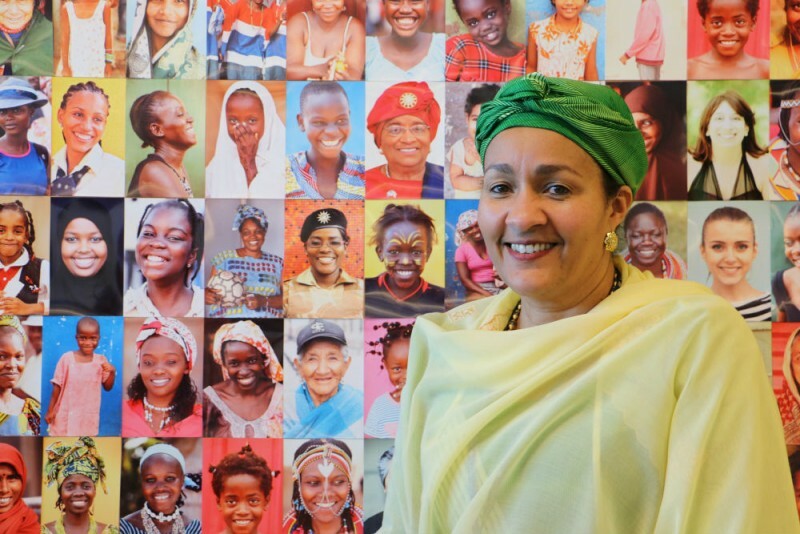 Amina Mohammed: With the MDGs, we only addressed the symptoms. We didn’t really address the root causes of such development challenges as gender inequality, lack of access to clean water and the insufficiencies of health services. We’ve learned through this experience that having a set of goals directs people to discuss, create partnerships and find investments to execute plans. We’ve also learned to agree on the means of implementation. With the MDGs, we agreed to finance them after the goals were adopted, so we were always running after the money. This time, finance is part of the package. We have taken a reality check. We agree on the existing and emerging challenges — from migration to inequality, to conflict, to climate change. The 17 goals are a response to the crises we have in the world today. Now, if by trying to solve these crises we are seeking paradise, then yes, that is our goal. Ownership of this agenda is what we wanted. Conversation about the process is not just among countries alone, but among stakeholders in many of the crisis-stricken countries we see, with solutions coming from the very same people. It is a very heavy agenda. This is a much more complicated set of commitments. It is a universal agenda. We have taken into consideration the experience from such unforeseen circumstances and considered what causes them. The goals seek to prevent conflicts by investing in people, infrastructure, in livelihoods and people’s aspirations. What we have done as member states is to include the human rights agenda because the fabric of SDGs is human rights. We have acknowledged that context matters, therefore the humanitarian issues that we face are also embedded in this agreement. But we are also saying that human rights and peace pillars need to be recalibrated so we can close that conflict gap. Those other agendas are the work of experts writing prescriptions. Ours was a process that took not just countries on board, but key stakeholders including parliamentarians, business people and civil society. However, there are legitimate concerns among some people. There is a trust deficit between what governments say and what they can actually deliver. What the UN does is promote the belief that the gap between rhetoric and actual practice can be bridged. I don’t think that’s the point people are raising. What we have said is, you can have a global set of indicators that will give you some comparisons to show us how, as one world, we are moving towards a set of objectives. But many more indicators have to be developed at the country level to reflect those countries’ priorities and contexts. The first challenge was to make this a universal agenda. People feared it could become too ambitious, and leave the poor behind. The second challenge was bringing the poverty agenda and the environment agenda together. There were concerns that one might outshine the other, although they are two sides of the same coin. The third was how to find the means of implementation. The fourth was accountability. Head-on. We talked it over with those who had these concerns. We had been talking for so long; North talking to South — usually Europe talking to Africa — and sometimes Southeast Asia. To bring Latin America, the Arab world and the small island states into this conversation was a different dynamic. You have to understand the ideology and concerns of all parties so that you find a common narrative on these issues. How will you convince somebody in the Arab world that the SDGs will work when you know that conflict is a present-day reality for them? But that didn’t stop us from agreeing that even when there is conflict, there are children going to school and women giving birth. When it came to inequalities, Latin America was a new area for us. We struggled with it, but we learned to speak the language and understand their concerns. There are 193 nations that own this agenda. The expertise of UN agencies will have to become fit for purpose to facilitate the SDGs agenda in host countries. The stakeholders at the country level are more than they ever were. So the donors, the UN, World Bank — all these partners need to have some coherence around sustainable development. Also, we have a broader range of stakeholders, including businesses, parliaments and civil society, because we are not just carrying out the social agenda, but we are also handling the environmental agenda and climate change issues. Civil societies have contributed to this agenda and share the ambitions that we have. They should have a role in holding us to account. They can be helpful in ensuring that the data revolution is fulfilled. We need to invest not only in traditional data, but also in data for real-time feedback to help decision makers. In some cases, civil society will be partners in implementation.